Hello Dealsnloot Readers,Scandid is back with a new recharge & bill payment discount offer . Now Recharge your Mobile or Make Bill payment of Rs 150 or more on Paytm Using Scandid app and get 10% / 4% Cashback in your paytm wallet . Not even this , One Lucky User will also get 100% Cashback Upto Rs 250 everyday.So Hurry !!! Grab This Loot Recharge Cashback Offer. Why is this a deal ? Scandid Verified user can earn up to Rs.2000 cashback each month. This offer is valid from 8th June 2016 to 31st June 2016. How to grab this Recharge Cashback offer ? 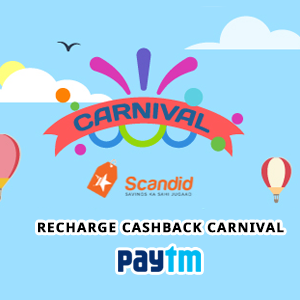 You will find Scandid Recharge Cashback Carnival offer. Proceed further by doing recharge. Update : We have observed and identified fraudulent activities of few users with the help of Paytm, all such transactions will not be eligible for recharge cashback and will accounts will be suspended by Scandid w.e.f. 25th May 2016. 1. 10% Cashback on Recharge/Mobile Bill Payment of Rs. 150 and above at Paytm through Scandid App. 10% cashback will be given on only first Recharge/Bill Payment transaction of user. 3. Scandid Verified user can earn upto Rs.2000 cashback each month. 4. In Addition to the existing offer, Every month 1 highest transacted user will get 100% Cashback, up to Rs.500. 5. This offer is valid between 8 June 2016 to 31 June, 2016. 6. Cashback would be credited to your Paytm wallet once we get confirmation from merchant, Confimation takes upto 45 days, as Scandid gets Rejection/Cancelled Orders list in upto 45 days from merchant. 7. Paytm Cash would be sent to the user on their registered email id with Scandid App only. 8. Users can use existing Paytm Coupon Codes along with Scandid's Exclusive Paytm Cashback offer. 9. Paytm Cashback offer is applicable only for Recharge/Bill Payment Transactions. 10.1. Login using multiple e-mail ID's on the same device to obtain the cashback offer is not allowed. 10.2. Multiple Recharges from same IP. 10.3. Recharge from variations of same email id. 10.4 Failed Recharges which are performed with invalid recharge amounts or invalid account types. 11. Scandid Recharge Cashback Carnival is available only on app version 5.8 and later. Users should update the app to avail the offer. 12. Scandid Recharge Cashback Carnival is not available on Scandid iOS App. 13. Scandid offers are not available for the users who keeps changing the Review on Google Play store based on their experience; all the complaints should be sent to customercare@scandid.in or from Feedback section of Scandid App. 15. Paytm Recharge transactions will not be visible on Scandid Rewards Screen, both are different promotions. 16. There is no Cashback for Paytm Wallet load transactions. 1. 4% Cashback on Recharge/Mobile Bill Payment of Rs. 150 and above at Paytm through Scandid App.